Following on from my earlier post I upgraded my installation to the new build of 6.5. it un-installed the old build and re-installed the latest without a problem, took about 30mins and required a reboot of the host OS. 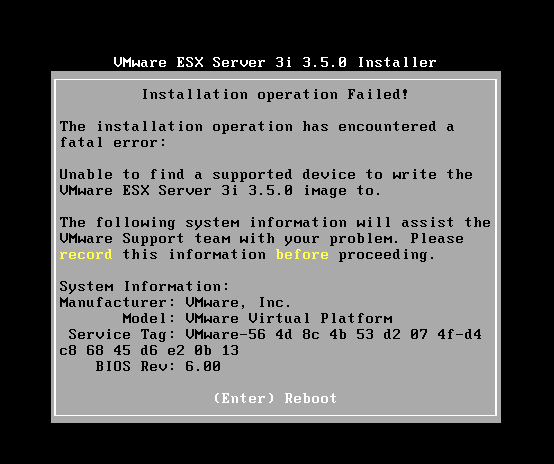 All my previously suspended XP/2003 VM’s resumed ok without a restart but needed an upgrade to the VMTools which did require a restart of the guest OS – all completed with no problems. Note – you need to select an x64 Linux version from the VM type drop down, if you have to go back and change it via the GUI after you’ve edited the .vmx file it overwrites the Ethernet card “e1000” setting to “vlance” so you need to edit again otherwise the ESX installer won’t find a compatible NIC and won’t install. it was initially very slow to boot; 5mins on my dual core laptop with only one error – which was expected.. It also seems to work for the installable version of ESX 3i… (although I’ve not quite figured out the point of that version yet :)). it did fail with an error the 1st time round..
this was because I had specified an IDE disk as per the ESX instructions, I changed it to a SCSI one and it worked ok. The ESX 3i install has a footprint of about 200Mb on disk, and ESX 3.5 uses 1.5Gb. I’m going to keep the 3.5 install on my laptop and will try to use linked clones to maintain a couple of different versions/configs to save disk space.. I’m sure I could knock up a quick script to change the hostname/IP of each clone – if I do I’ll post it here. Why would you want to do this? well because you can, of course 🙂 and its handy for testing patch updates and scripts for ESX management etc. I will also try to get a ESX DRS cluster running under workstation with a couple of ESX hosts and shared storage over iSCSI using something like OpenFiler as shown here. won’t exactly be production performance, but useful for testing and demo’ing. what do I need to do here to remove that debug things and run fast ? 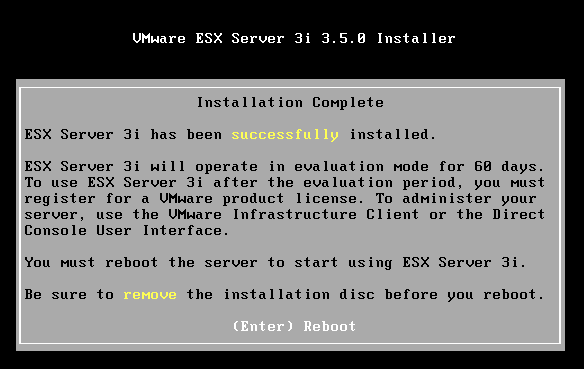 Hi, has any one tried to install ESX 3.5 on a VM in ESX instead of Workstation? if you are running a beta build (like 6.5) when you run vmware.exe it will run vmware-vmx-debug.exe. so, rename vmware-vmx-debug.exe to be vmware-vmx.exe and it should work. That said, I know techhead (http://www.techhead.co.uk/)was having a similar problem today with the ESX under VM Workstation 6.5 image it not performing very well, even after forcing vmware to run non-debug, still not got to the bottom of that one, we even copied my image to his laptop – so maybe thats a hardware/performance problem? 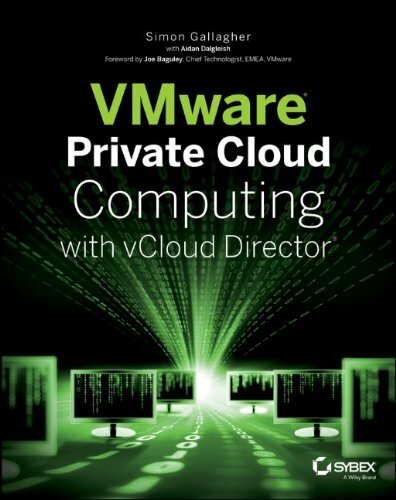 I’m having difficulty getting a vm to run under esx under workstation – is this possible? Did you build VMotion env? VMotion time out in my env. I’ve not tried this, would think it /could/ work but would be v.slow, which might explain the timeout you experience – I’ve only used this VM under a VM approach for testing scripted installs, testing things etc. Any idea if you can run ESXi under rc2 of Server2? it`s normal about 1 hour to initial up this server?? i use core 2 duo 1.66gh and assign 2 gb memory to that virtual server. You said “I will also try to get a ESX DRS cluster running under workstation with a couple of ESX hosts and shared storage over iSCSI using something like OpenFiler as shown here. won’t exactly be production performance, but useful for testing and demo’ing.”. Did you already try it? Didn’t get that far with it – from my initial attempts the lack of performance I was getting from running it on my laptop was making it look impractical – I’ve been relying on ESX/OpenFiler running on cheap ESX PC’s like the HP D530 for my demo/lab setups.